If Utah Governor Gary Herbert has his way, the state of Utah would have the authority to clear public lands of wild horses "to keep ranges open for cattle grazing." That's right. Even though wild horses are protected under federal law, Governor Herbert says Utah "should take over the horse management” on federal lands within the state. Such a move would set a dangerous precedent by giving ranchers and their allies in state governments the power to wipe out wild horses for good to make even more room for livestock grazing. Governor Herbert is one such ally of ranchers and it's not surprising to see him using their talking points to scapegoat wild horses for the damage to our public rangelands caused by livestock. This is a particularly egregious claim to make in Utah, where fewer than 3,500 wild horses remain while hundreds of thousands of commercial livestock graze on public land. We've already sent the Governor a letter to set the record straight. Will you follow it up with a faxor letter to request he back off his position and respect federal law? 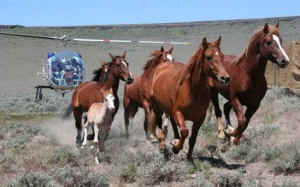 I'm writing to express my opposition to your recent comments about wild horses. Not only does your position rely on erroneous facts, but also it ignores solid public support for protecting wild horses and burros on our public lands. Your position that wild horses are damaging public lands doesn't add up: Livestock grazing occurs on 22 million acres of BLM land in Utah, while wild horses are restricted to just 2.1 million acres. Your position is unpopular: Only 29 percent of Americans want to ensure that our public lands are available for livestock grazing. With these facts in mind, I request you publicly retract your previous statements that wild horses should be managed by the state of Utah. Additionally, if Utah maintains its anti-wild horse position, then I will be sure not to spend my tourism dollars in your state, and I will tell all my friends and family to do the same.